Yesterday I did something that I’ve been putting off for eight months. Yesterday, I wrote back to both of the couples I met in the beginning of the year when I was trying to find Roo’s family. I hardly knew what to say. I spent probably twenty minutes on each letter, struggling to find just the right words, to say the right things – to explain why I didn’t choose them. That I couldn’t choose them – that God had someone else in mind. They are all wonderful people and I love and respect them. But I couldn’t deny what I knew. 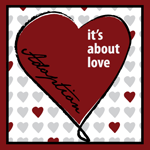 When I first chose adoption, both couples came back into my mind and I resolved, as I had in March, to choose between them. But it soon became obvious to me that I couldn’t choose either of them. I still wonder about them. I’m pretty sure one couple has since been chosen by a birth mother. I couldn’t be happier for them. I don’t know about the other couple, but I feel certain that their birth mother simply hasn’t found them yet. It’s sort of strange, actually – I feel guilty for meeting them and getting their hopes up. Part of me wishes I hadn’t met them because I think I’ll always feel bad for not choosing them. I hope they can understand that I didn’t choose Roo’s family – God did, and I only found them. She wasn’t meant to be with them. She was meant for P and M.
I’m sure that’s cold comfort to a couple who want a child more than anything else in the world. I’ve found that I still think about both couples a lot, and wonder how they’re doing. I wonder if the second couple has had any contact with birth mothers lately, and I pray that they will. I check both couples’ blogs every so often. 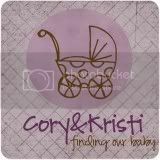 I find myself drawn to adoptive family blogs, fascinated. 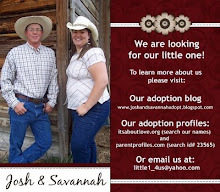 It’s the side of adoption I’m less familiar with, and there are a number of “We’re hoping to adopt!” blogs that I check regularly. It amazes me how many absolutely great couples there are out there who can’t have children. In honor of them and other “paper pregnant” couples, here are a plethora of buttons for you to click on. 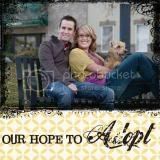 Each one links to the blog of an adoptive couple, and they are all cool people. 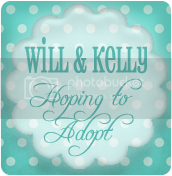 In clicking around to find buttons to post, I was floored at just how many people out there are looking to adopt to grow their families. It’s heartbreaking! Check them out – if not for yourself, then for someone you know. I’m proof that sometimes, when something doesn’t feel right, you just have to keep looking until you find not what you were looking for but what God wants you to find. (FYI, I chose all of these buttons because the blogs they link to had a handy "Add our button" sidebar with an html box to copy and paste. There were several others where I would have had to save the button to my hard drive and I had to tweak the html in my blog post to make it work. I recommend making it as easy as possible for people to add your button. There is a fantastic tutorial here on how to get that little html box. Thanks for including us, that means a lot to me. I can't speak for other couples, but I can speak for myself. Just to be looked at means the world to me. After going months and months with no contact, just to have someone say "You're nice" means the world to me. I know at least someone is seeing our profile. But I also believe that God will help us find our child so I'm hoping that if I ever do get a "no, I'm sorry it's not you" I will be able to accept that. I think that is awesome you wrote the other couples just to let them know. You really are an amazing women. Yay! That was so nice of you to feature those blogs! I use google analytics to track traffic to our profile and this morning I saw three visits from a site I didn't recognize. Your site. Thank you so much for adding our button. For some reason, today has been a hard day for me but after finding your site, my tears are now ones of gratitude. Thank you for caring and sharing. 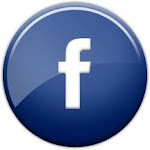 I look forward to getting to know you and reading your blog! Thank you so much for including us! You are such a sweetheart! 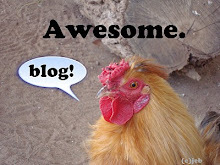 I can't wait to start following your blog. We love Birth Mothers that for sure! Thank you so much for including us on this list!